Learn more about Member Connection by downloading the Member Connection Flyer. Allied Funding Advantage major medical employer-sponsored health benefit plan. Your ID card shows an "Allied Member Connection Registration Code" on the back of your ID card. ​If you see that code – Congrats! Now click here to start your access to Allied Member Connection. Please note: If you have already registered with Member Connection and recently received a new ID#, you do NOT need to re-register. To register, click on the Get Started Now button or visit Google Play or the App Store! Click on the image to the left for a quick, fun video and learn how to get the most out of this benefit. To determine if you have access, check the back of your health plan ID Card. 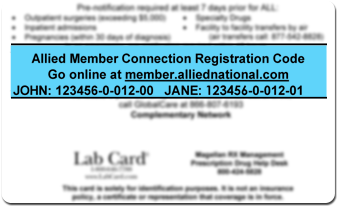 Sample of an Allied Member ID Card with Member Connection access. Note: The blue portion is enlarged for viewing purposes and is NOT blue or enlarged on the actual ID card. For health issues like a cold, flu, allergies or sprained ankle, telehealth is rapidly becoming the favored way to seek immediate help. Want to know more? Visit Allied's telehealth website page. Use your smartphone or PC to access your Allied Member Connection account and look for the "Start a Virtual Care Visit" button. Once you register, you can have a phone or video consultation with a health care provider. Your cost depends on whether you have an HSA ($49) or non-HSA ($0) health plan. Either way, you pay less for a telehealth visit than for a traditional office visit. Click the image to the right and download our informational flyer about telehealth - an important part of your Allied Funding Advantage plan.